I am going to show you how to freeze a cake with frosting and it should not damage your frosting at all. 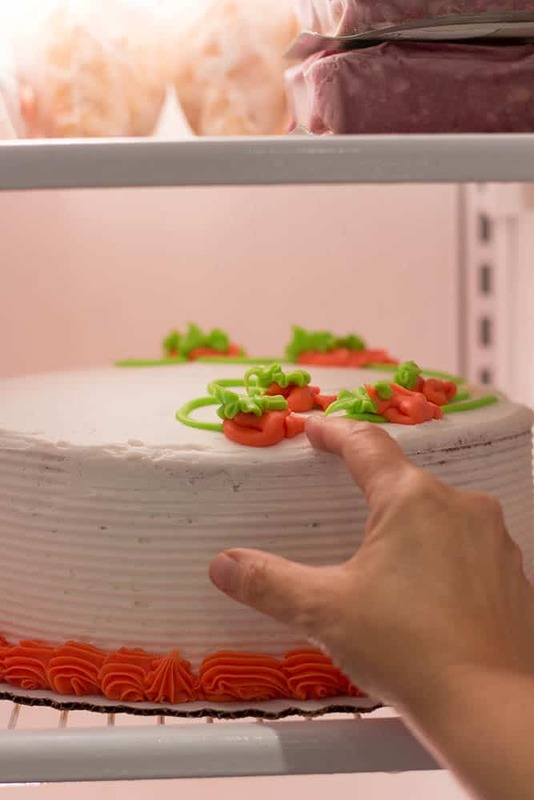 Freezing cakes will keep your cakes moist and fresh. This is one way to help pull off a stress-free meal when entertaining. I make cakes ahead of time and I freeze them until the day I serve the cakes. I learned this trick when I was in Culinary School. When you take the cake out of the freezer to defrost, it will help moisten the cake. You can freeze the layers of the cake unfrosted if you would like and I do this sometimes, but my favorite way is to frost the cake and then freeze it. 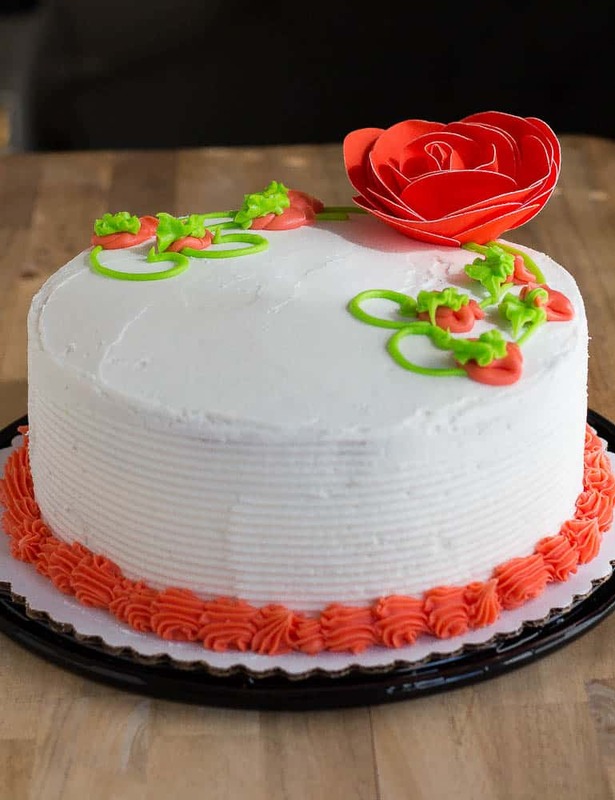 The frosting provides a barrier to keep a cake from drying out. I used a decorated birthday cake for this tutorial to show how freezing a cake correctly will not damage your frosting. 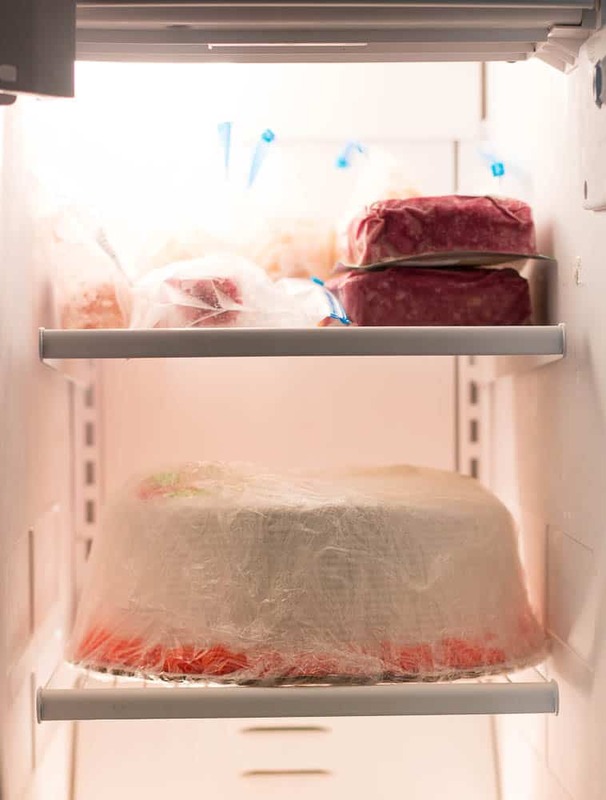 Sit your cake in your freezer without anything covering the cake. I know that it seems like this will ruin your cake, but it will not. Let the cake sit in the freezer until the icing hardens. It usually takes at least one hour. Touch the icing and make sure that it is hard. 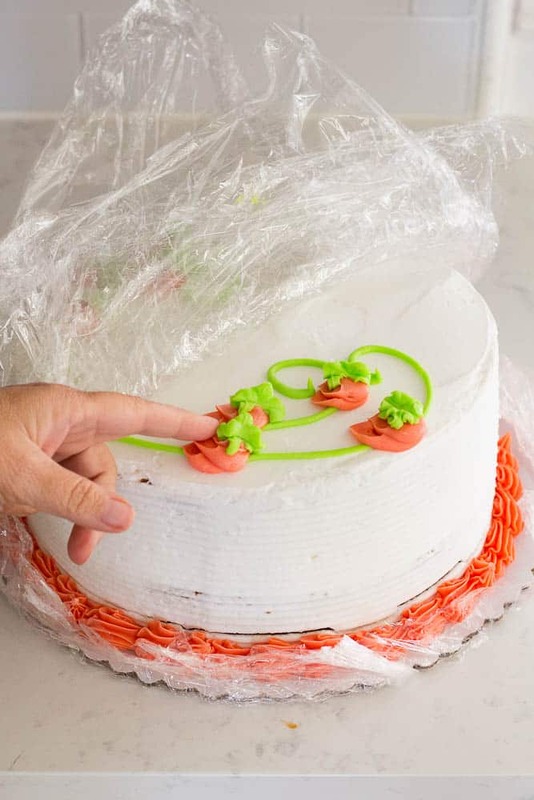 It should be hard enough that your fingers do not damage the icing in any way. 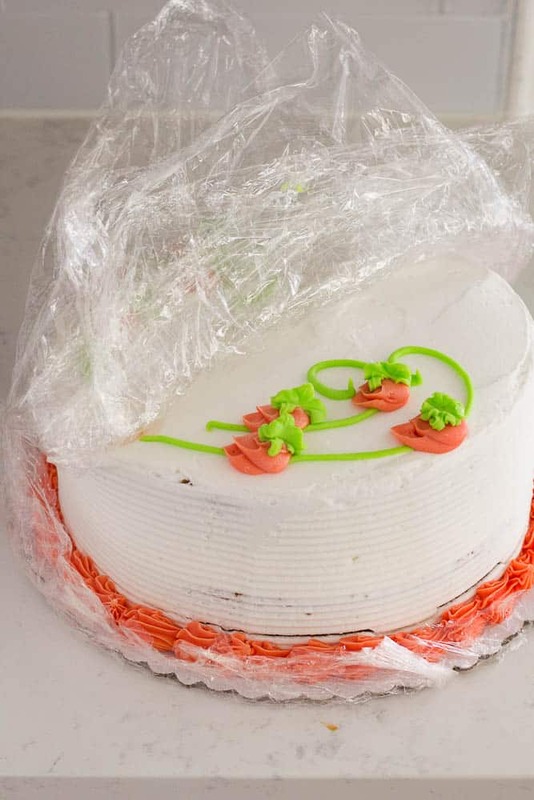 Cover the hardened cake well with plastic wrap. 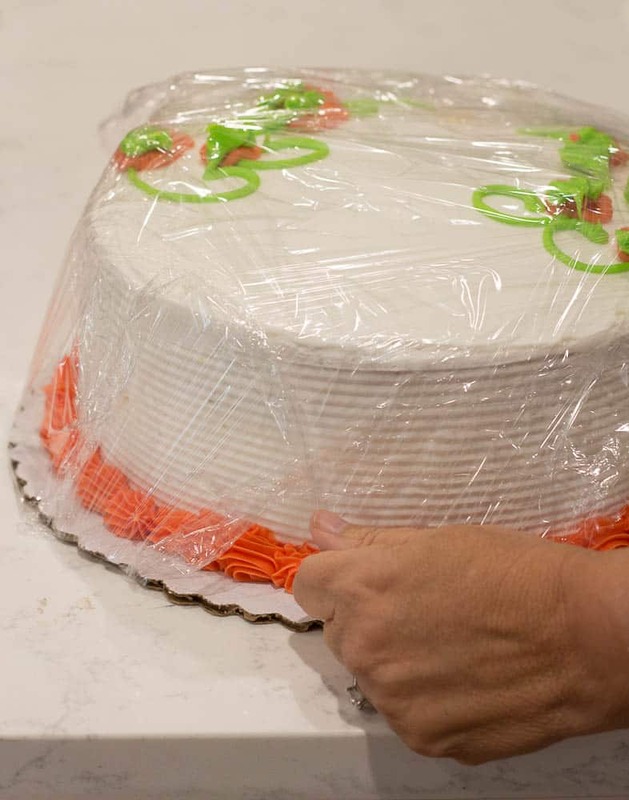 I usually wrap the plastic around the cake several times and make sure there are not any holes or gaps in the wrap. Sit the cake back in the freezer until you are ready to serve. Most people say that the cake will be good for a month or two. I have left one in a little of two months and it was perfect. 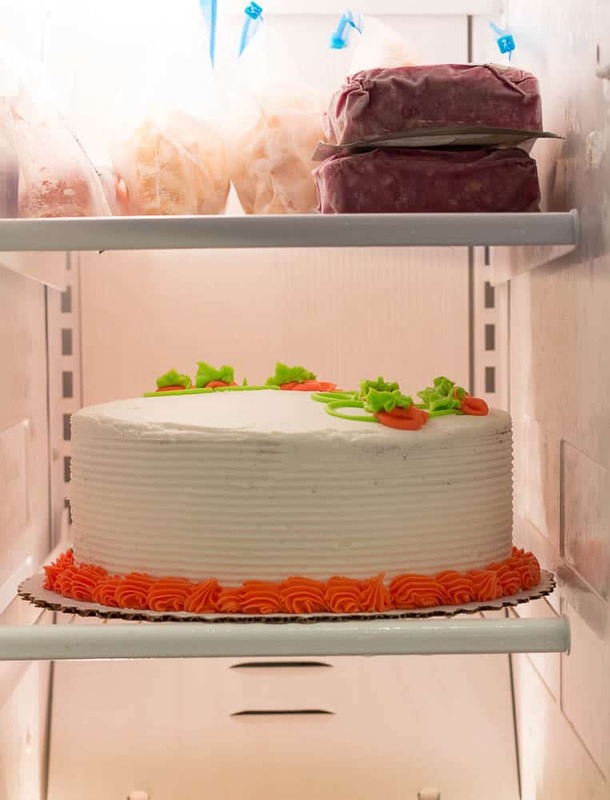 I like to remove the cake from the freezer several hours before serving. I will cut the plastic wrap with scissors to remove it. Take the cake out of the freezer several hours before serving. As you can see in the photo, the icing looks perfect! If I am cooking for a holiday meal, I will make a couple of cakes and freeze them until the day of the meal. Freezing cakes and having them already baked help makes holidays less stressful. Thank you for this tip, I did not know this could be done. I will surely try this. thank you for having this tutorial step by step can u freeze a cake cut in sections like 2 pieces and take them out to have latter ? Yes, you can. I do it all the time and you would think that the edges might be hard but they are just as soft as when you cut the cake. Also, it does not take long to defrost so when you want a dessert for yourself, you have it! I have put cakes in the freezer that way and when they thaw they get condensation that beads up and changes the color of the frosting. Is there a way to prevent this? I have not had issues with the color of the icing changing. 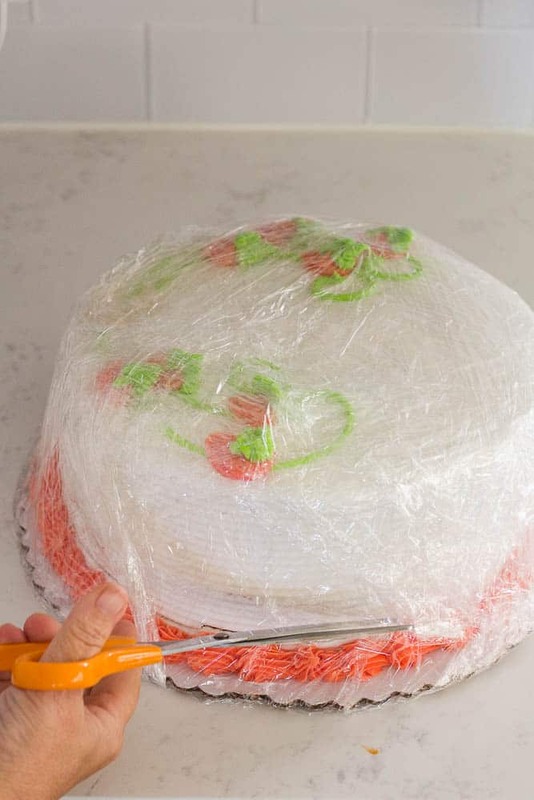 When I take the cake out of the freezer, I loosen the plastic wrap from the bottom but keep the plastic wrap loosely laying on top of the cake so that the condensation sticks and beads on the plastic wrap instead of the cake. I hope this helps!